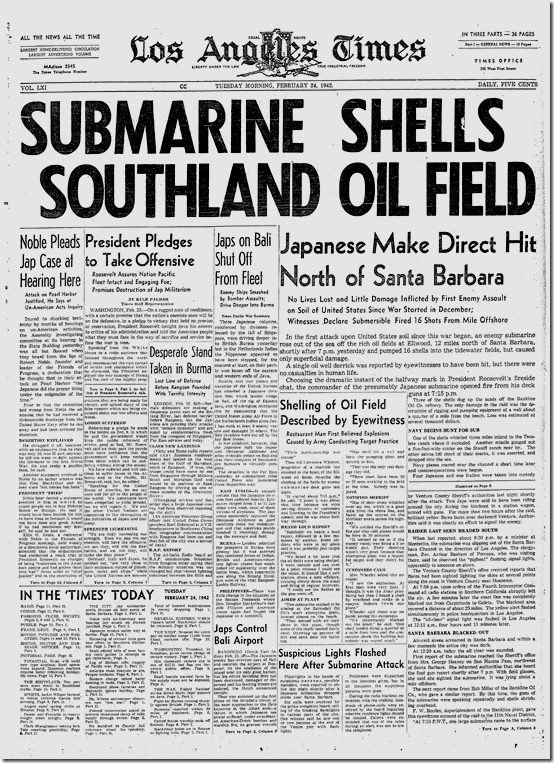 On February 23rd, 1942 at about 7:15 pm, shells began falling on Ellwood Oil Field west of Santa Barbara in what is today Goleta. At least 16 rounds (some reports say as many as 25) were fired on the oil facility over a period of twenty minutes as a Japanese submarine sat offshore bombarding the coastline. The rounds were 140 mm (5.5 inches). World War II had come to the West Coast, and this was the first attack on the North American mainland. After the attack on Pearl Harbor, the Japanese had seven submarines patrolling the west coast. The U.S. Navy had a few conflicts with them, and several merchant ships were attacked and sunk by the submarines. Around 7pm on February 23, 1942 just as President Franklin Roosevelt's Fireside Chat began on the radio, Japanese submarine I-17 commanded by Kozo Nishino sailed up to Ellwood Oil field, surfacing a few hundred miles off the coast. I-17 was over 365 feet long, displaced 3,713 tons, carried 17 torpedoes along with 101 crew, had six torpedo tubes and on its top deck a 14 cm deck gun. Whoever was firing wasn't very accurate, as out of the sixteen to twenty-five rounds fired, very few actually damaged anything. An oil derrick, a pump house (the tin door was blown off), a catwalk, and the Ellwood Pier were all damaged in the attack. Damages totaling about $500. One shell even landed on a nearby ranch, not even exploding upon impact, although it made a hole about five feet deep. All said and done, it was a pretty pathetic assault on the facility. There are two theories on why Kozo Nishino had his Japanese submarine attack Ellwood. The main one is that Goleta had supplied Japan for decades with oil, until the bombing of Pearl Harbor. 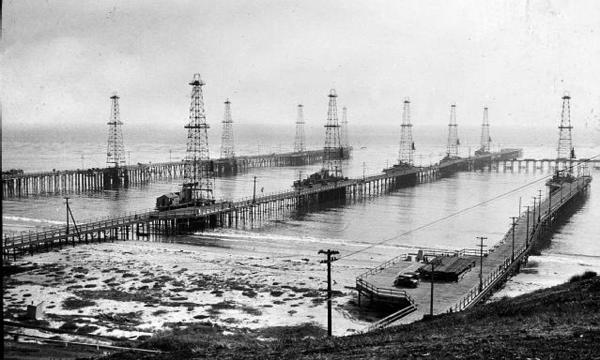 Because of the large amount of oil being produced in Goleta, along with the low amount of military presence as compared to Los Angeles and San Francisco, it was deemed a good strategic target to attack. But the other theory is more interesting. Prior to World War II, oil tankers from Japan often loaded up oil at Ellwood, and one of these tankers had Kozo Nishino as captain. 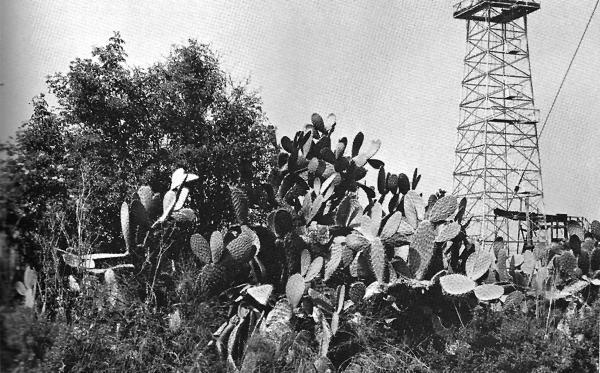 If you believe the story, Ellwood fields had a fenced in area containing an old patch of prickly pear cactus. While his oil tanker was being loaded, Kozo Nishino took a walk on the beach, saw the prickly pear cactus and decided to take a cutting back to Japan with him. While he was climbing the fence, he slipped, and fell into the plant. As his crew members helped him out of the patch, Ellwood Oil Field workers laughed and ridiculed the Japanese Captain, who humiliated by the experience, seethed with anger and vowed revenge. Vengeance he tried to achieve in 1942 when he was now in command of a military submarine. Regardless of which theory you believe, and despite the pathetic amount of damages sustained in the attack, the incident had massive repercussions for California, thus continuing and heightening the invasion scare that had gripped the west coast during the war. This paranoia reached a tipping point less than two days later in the infamous Battle of Los Angeles during which all of Los Angeles was placed under a mandatory blackout while searchlights and anti-aircraft guns scanned the night skies. Back in Japan, Radio Tokyo reported that "Santa Barbara, California was devastated by enemy bombardment". Other records noted that Santa Barbara was left in flames. U.S. propaganda responded with an "Avenge Ellwood!" campaign. 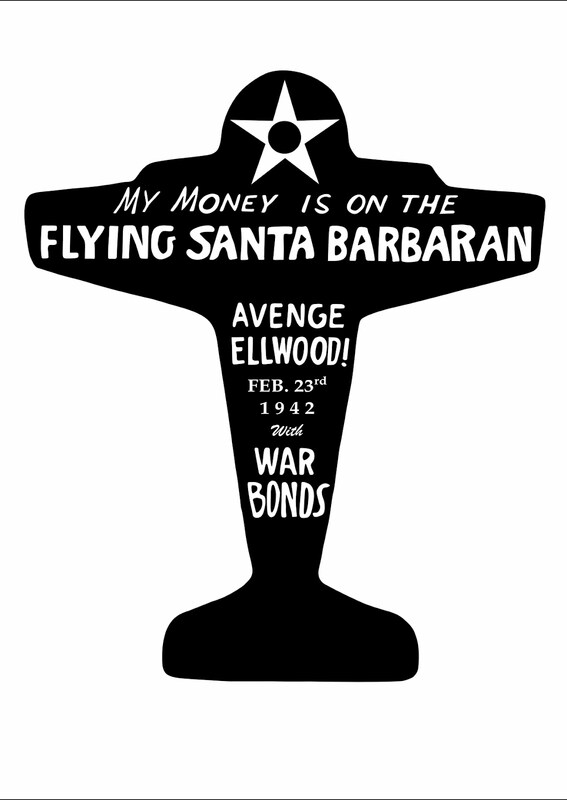 Created in early 1943, the "Avenge Ellwood" logo was used to sell war bonds with the money going directly to the purchase of a bomber carrying the name "Flying Santa Barbaran" and a fighter plane, the "Ellwood Avenger". Paranoia increased as stories surfaced that the I-17 supposedly signaled the mainland after its attack on Ellwood. It was also implicated that a Japanese family signaled the submarine from the coast before the attack, although in reality it was probably a car's headlights moving through the nearby mountainside. Rumors began mounting that the Japanese had set up secret airstrips throughout Southern California. Then Mayor of Los Angeles Mayor Fletcher Bowron called up Washington DC demanding that they round up every Japanese resident in Southern California. As paranoia increased this sadly led to the establishment of WRA Relocation Centers. WRA Stands for War Relocation Authority. The WRA was created by Executive Order 9102 by President Roosevelt on March 18th, 1942. President Roosevelt had prior on February 19th, 1942 signed Executive Order 9066 which allowed military commanders to designate military areas as exclusion zones from which any or all persons may be excluded. These two Orders combined led to the internment of over 110,000 people of Japanese heritage, most of which lived along the west coast of the United States. About 30,000 were children. In additional 11,000 people of German ancestry, 3,000 people of Italian ancestry, and even a few Jewish refugees were later also interned under these orders. 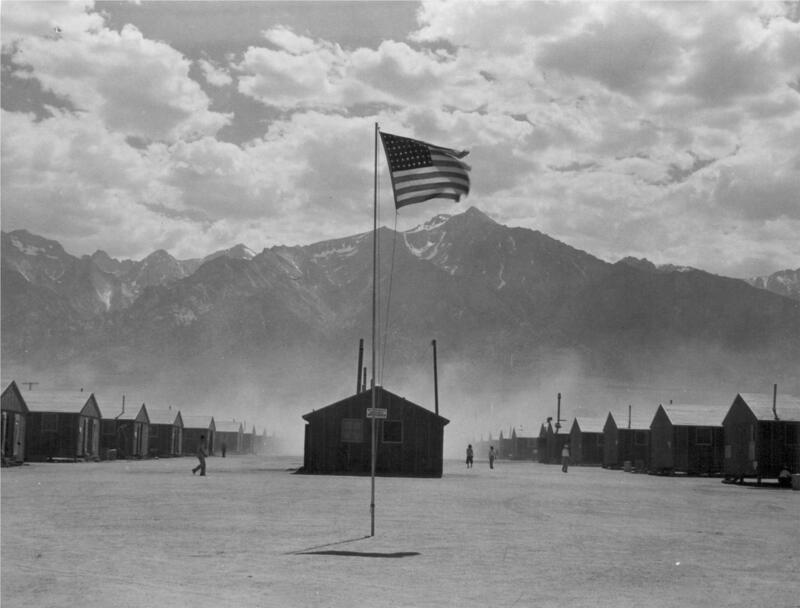 Ten Relocation Centers or internment camps were created in seven states. Two were set up in California. 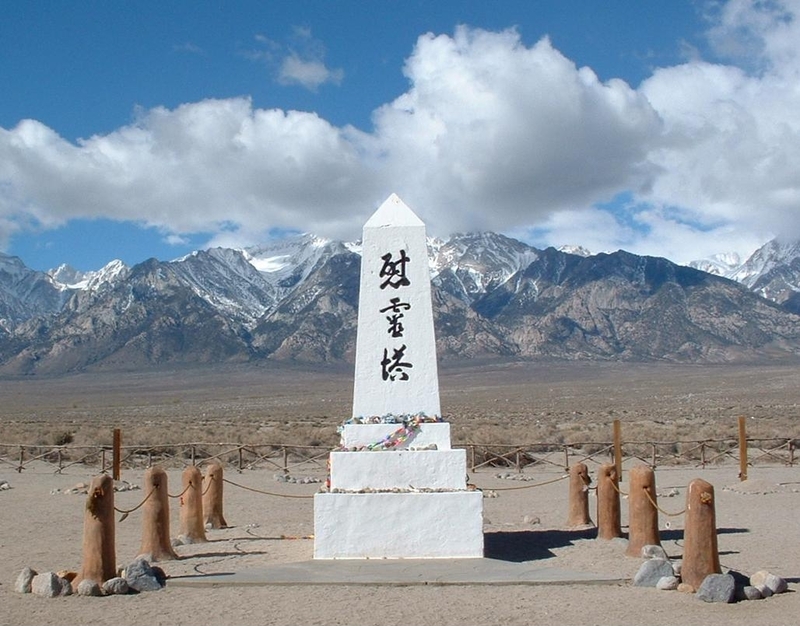 One was in Manzanar and had a max population of 10,046 (although 11,070 were incarcerated there), while the other was at Tule Lake, and was the biggest and most controversial of the Relocation Centers holding 18,789 people. Many of its inhabitants were those who refused to answer or answered wrong one of two loyalty questions that were asked of those interned at other Relocation Centers. On January 2nd, 1945, the orders to intern people in the camps was rescinded and those interned inside were free to return to their homes. Japan, in an effort to demoralize and cause mass damage to the west coast of the United States, launched over 9,000 fire balloons. They were suppose to drift over the U.S., explode and cause massive fires and chaos. About three hundred of them actually made it to the West Coast. Each balloon carried either an incendiary bomb or an anti-personnel bomb. Sadly six people were killed by the balloons, five Sunday school children along with the pregnant wife of a minister. This happened near Bly, Oregon. One balloon even made it as far a Omaha, Nebraska, exploding on April 18th, 1945. Luckily no one was injured and no damage resulted. The remains of some of the fire balloons that made it to the mainland were found in remote areas for years to come; the last being reported in 1978. 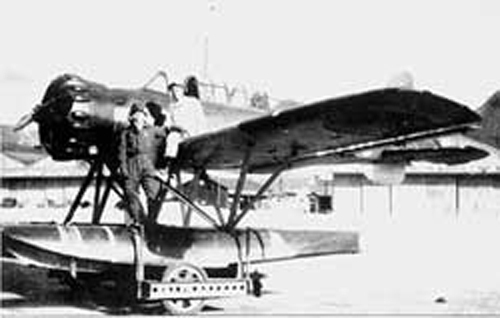 Brookings, Oregon actually had a small Japanese plane bomb them. 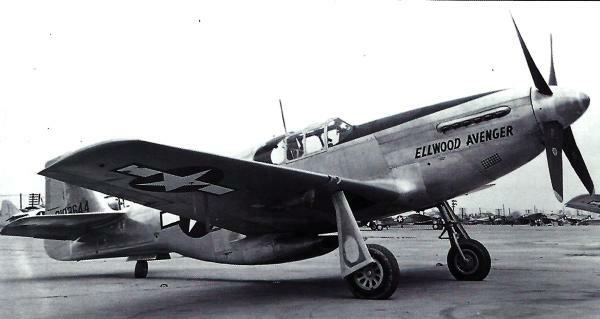 It was launched from a nearby submarine, I-25, on September 9th, 1942, flew over the forest and dropped a bomb. Luckily the resulting fire was underwhelming and quickly put out. The pilot was Noburo Fujita. In 1962 he returned to Brookings and as an apology he gave the town his 400 year old samurai sword which had been handed down from generation to generation in his family. The sword hangs in the town library and Fujita was eventually made an honorary citizen of the town. The submarine I-17 was eventually sunk near Australia off the coast of New Caledonia on August 19th, 1943 by a armed trawler of the Royal New Zealand Navy (HMNZS Tui) and a U.S. Kingfisher floatplane. Ninety one of the crew were lost. Rumor has it that only one crew member is still alive today and is over 100 years old now. Today there is not one, but two separate markers commemorating the attack on Goleta that day. The first marker is a plaque set into a rock on the edge of a golf course overlooking the ocean. Take US Hwy 101 and exit on off ramp 110. Turn west towards the beach, then right at the first stop sigh onto Hollister Avenue. The golf course will be on the left. Walk thru the parking lot, past the building, and as you get to the golf course, the marker will be there where the path splits. The second marker is a sign standing on a pole near the beach behind the Barca Resort and Spa. It is further down Hollister. Exit the golf course parking lot, turning left onto Hollister Avenue. Drive about a half-mile, during which you will pass on the left the current present day installation for Ellwood, then turn left into the parking lot for Barca Resort and Spa. The buildings for the resort will be to the right of the parking lot. In the back of the parking lot is a path that will take you between the tennis courts. Walk along the path, past the tennis courts, toward the beach. Before you get to the beach there is a beach-house-like building. Take the trail that runs behind the "Beach House," and at the fork in the trail that leads to the beach, on the left side, on a pole, is the historical marker.